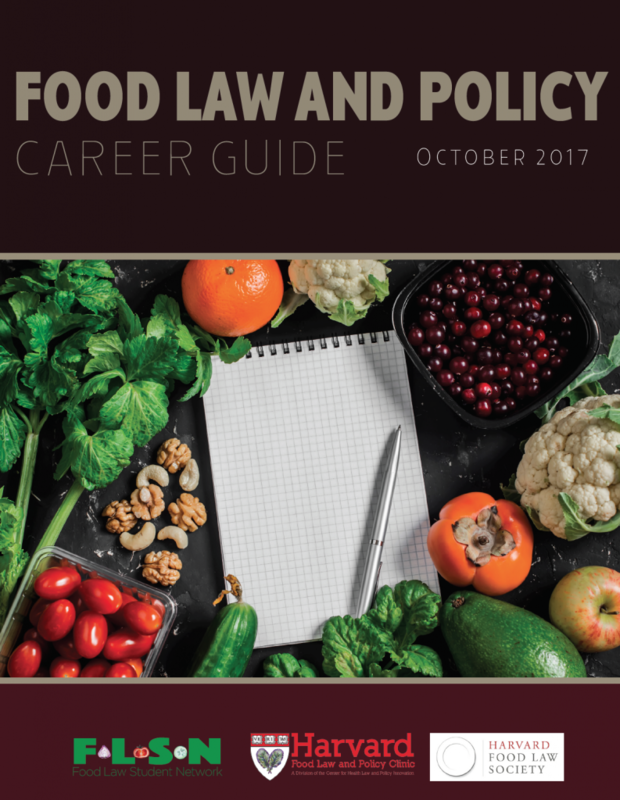 Today, the Harvard Law School Food Law and Policy Clinic (FLPC) releases the fourth edition of the Food Law and Policy Career Guide, updated for 2017. Created with Harvard Food Law Society and the Food Law Student Network, the career guide includes new information and opportunities in a range of areas of interest to those looking to build careers in food law and policy. The fourth edition encompasses employment opportunities at universities, government agencies, non-governmental organizations and research institutes, international organizations and agencies, law firms, and consulting and consultancy firms. It also includes information on fellowships and grants, and listservs that can help link job seekers to recently announced openings, as well as other breaking news about our food system. There’s been incredible growth in the area of food law and policy since the release of the last career guide. While we have attempted to make this guide as exhaustive as possible, there may be new opportunities that are not reflected. Please let us know about these opportunities so we can make the next edition even more comprehensive. We encourage recent graduates, current students seeking internships, and those just curious about this area of the law to take advantage of the wide range of information in the guide, and to share it with their network to drive awareness of this useful resource! Additionally, for current students interested in the area of food law and policy, FLPC is now accepting applications for its 2018 Summer Interns Program. The program will run from Monday, May 21st to Friday, July 27th. Summer interns in the Food Law and Policy Clinic have the unique opportunity to engage in action-based learning to gain a deeper understanding of the complex challenges facing our current food system. For more information about the Summer Interns Program and how to apply, please see the full posting here. Read the Food Law and Policy Career Guide. What Dates Are Best to Determine Food Safety? Published by Herald-Mail Media on October 23, 2017. Written by Jeff Semler, an Extension educator specializing in agriculture and natural resources for the University of Maryland Extension. The U.S. alone wastes 160 billion pounds of food—nearly 40 percent of food produced in the country—annually. A report from the Natural Resources Defense Council and Harvard Law School’s Food Law and Policy Clinic says Americans are prematurely throwing out food, largely because of confusion over what expiration dates mean. Most consumers mistakenly believe that expiration dates on food indicate how safe the food is to consume, when the dates actually aren’t related to the risk of food poisoning or foodborne illness. The issue recently came home to roost for me. We had an open house at one of our research and education centers, and we had some milk left over. I was tasked with giving it away. When I took it to the first place, I was informed they couldn’t use it all before the sell-by date passed. I reminded the person it was a sell-by date, not a use-by date. She then related she was aware of the difference, but if inspectors paid a visit and found the out-of-date milk, she could get in trouble. Here is another incidence where a government official is guilty of throwing the baby out with the bath water. If anyone should know the distinction between the two dates, it should be someone from the health department. In an effort to reduce food waste, it is important that consumers understand that the dates applied to food are for quality, not safety. Food products are safe to consume past the date on the label, and regardless of the date, consumers should evaluate the quality of the food prior to its consumption. Use-By: This label is aimed at consumers as a directive of the date by which the product should be eaten; mostly because of quality, not because the item will necessarily make you sick if eaten after the use-by date. However after the use-by date, product quality is likely to go down much faster and safety could be lessened. Sell-by: This label is aimed at retailers, and it informs them of the date by which the product should be sold or removed from shelves. It does not mean that the product is unsafe to consume after the date. Typically, one-third of a product’s shelf life remains after the sell-by date for consumers to use at home. Best-by: This is a suggestion to the consumer on which date the product should be consumed to assure ideal quality. Brackett also points out that smell and taste are not always good indicators of whether a food is safe to eat. Foul smells are more indicative of poor quality, not necessarily potential food poisoning. While I am not advocating you ignore dates, I suggest you use a little common sense and start reducing food waste in your home. Written by Nick Niedzwiadek on October 23, 2017. Published by Politico Pro. A number of the state’s Medicaid managed care organizations do not offer enough public information about their hepatitis C policies, according to a report released on Monday. The report, conducted by the National Viral Hepatitis Roundtable and Harvard Law School’s Center for Health Law and Policy Innovation, analyzed policies in all 50 states, Washington D.C., and Puerto Rico related to Medicaid recipients’ access to hepatitis C treatment. The report gave New York a grade of B-. The vast majority of New York’s 6.1 million Medicaid recipients as of July were enrolled in managed care plans rather than the traditional fee-for-service model. Unlike some other states, New York no longer restricts access to life-saving treatments to only those in the most serious condition in order to save costs, a major victory for advocates who decried a policy that seemed to require that people get sicker in order to get better. Hepatitis C is a blood-borne virus that damages the liver and often spreads among intravenous drug users. It can lie dormant for years before showing symptoms. The disease lacked a cure for years, and available treatments had painful side effects. Recent drugs like Sovaldi and Harvoni have proven effective, but run tens of thousands of dollars for a single course of treatment, even after rebates are factored in. Treatments for hepatitis C account for a significant portion of the state Medicaid programs’ total drug spending, though the rate of new cases has slowed, raising hopes that costs will eventually decline. Since 2014, the state requires all physicians to offer patients born between 1945 and 1965 a hepatitis C test. The report recommended the state remove requirements for patients to prove sobriety in order to access treatment, and to promote parity among the various Medicaid plans with regards to hepatitis C.
“With minimal changes, New York could have open access to hepatitis C treatment,” it states. A spokesperson for the Department of Health said the agency was reviewing the report. Written by Ed Silverman on October 23, 2017; Published by STAT. Over the past three years, state Medicaid programs have done a much better job of disclosing information about access to expensive hepatitis C medicines and fewer are restricting treatment to patients, according to a new analysis. In 2014, 12 states did not make public their criteria for treatment, but all 50 states now do so (although one state, New Jersey, does not disclose specifics for treating different stages of the disease). And in the past three years, 17 states dropped restrictions to access based on a patient’s stage of liver disease, which has been a key test for determining treatment. In 2014, all 50 states had restrictions. Nonetheless, a fair number of states continue to impose various restrictions that impede access to treatment, even though prices for the medicines have started to fall, according to the authors of the analysis, who argue this violates federal law and runs counter to treatment guidelines and a notice from the Centers for Medicare and Medicaid Services (here is a state-by-state report card). Two years ago, CMS officials warned state Medicaid programs against “imposing conditions for coverage that may unreasonably restrict access” to hepatitis C drugs. Placing restrictions may be “contrary to the statutory requirements” of a federal law that requires state Medicaid programs to pay for all medically necessary treatments, they wrote. The issue has gotten the attention of the National Governors Association, which is planning a meeting later this year to explore strategies for lowering costs, notably for hepatitis C drugs. Meanwhile, though, patient advocates are angry that federal and state officials are turning an indifferent eye to a substantial public health problem that will linger for years. Figures vary, but a study released two years ago by the Milliman consulting firm found that, of the nearly 2.7 million Americans living with hepatitis C, about 457,000, or 17 percent, are on Medicaid. To what extent that subsides is uncertain, but Wall Street analysts, for instance, have noted that a groundswell of people who are infected with the chronic disease have already been treated. But last week, the AIDS Institute, a non-profit that also focuses on hepatitis C treatments, wrote a letter to CMS officials and urged them to enforce the 2015 state notice and prevent state Medicaid programs from restricting access. One point the group makes is that there is a “misconception” about pricing, since at least one newer drug carries a much lower list price, which should ease the strain on state budgets. The “continued false statements about the price of the cure and its impact on their budgets inject untruths into the debate on drug pricing, while distracting from the fact that people who need treatment are being kept from it,” the AIDS Institute wrote. “If state Medicaid programs want to save money, increasing restrictions is not the answer,” since prices are starting to fall. The drug, called Mavyret, is sold by AbbVie (ABBV) and carries a $26,400 list price. This is well below the $84,000 price tag for Sovaldi, a Gilead Sciences (GILD) drug that was the first in the new generation of hepatitis C medicines. At the time the $1,000-a-day pill was launched nearly four years ago, the cost alarmed private and public payers, since the high cure rate triggered a wave of people seeking treatment. Despite arguments that the newest medicines — Gilead subsequently sold Harvoni, and AbbVie also debuted Viekira Pak — would lower long-term health care costs, the near-term expense for treating a surge of people quickly strained budgets. Many state Medicaid directors responded by implementing restrictions which, in turn, prompted the CMS warning and, later, lawsuits against a few states. Last year, the Washington state Medicaid program was ordered to lift restrictions on coverage in response to a lawsuit filed by state residents who claim the drugs are “medically necessary.” The Center for Health Law and Policy Innovation has been involved in pursuing litigation against state Medicaid programs in Colorado and Missouri. And the American Civil Liberties union filed a suit in Indiana. We asked the National Association of Medicaid Directors and the Medicaid Health Plans of America, a trade group for Medicaid managed care plans, for comment and will update you accordingly. 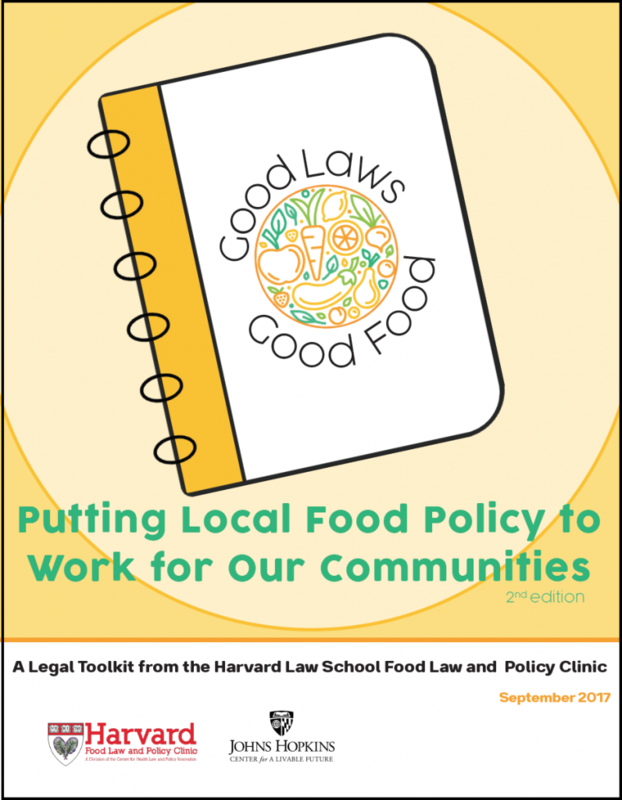 The Food Law and Policy Clinic at Harvard Law School, partnering with the Johns Hopkins Center for a Livable Future, has released an update to the toolkit Good Laws, Good Food: Putting Local Food Policy to Work for Our Communities. The toolkit is designed to aid individuals and groups, including local food advocates and nonprofit organizations such as local food policy councils, working to change their local food system. This toolkit was created to provide a starting place for these individuals and groups to understand basic legal concepts surrounding local food systems, develop a base of knowledge about the main policy areas, and be inspired by innovative policy solutions from other cities and states. A growing number of local food advocates have become concerned about the impacts of the current food system on our health, our environment, our national and local economies. These advocates are discouraged by the system’s environmentally damaging practices, inequitable distribution of healthy foods, and lack of opportunity for civic engagement in the current model of food production and consumption. Recognizing these issues, many advocates have attempted to search for methods to reverse them with healthy, environmentally sustainable, and economically and socially just food policies. However, local food advocates can find it difficult to identify the specific laws and regulations that impact their food policy goals, analyze these laws and policies, and ascertain the legal or policy levers that can be used to improve outcomes. Good Laws, Good Food: Putting Local Food Policy to Work for Our Communities (2nd ed.) was created to enable food advocates to overcome these challenges. This updated second edition accounts for some of the changes that occurred in food policy over the past five years and adds new sections on food waste and food procurement, and updates other sections such as school food and nutrition education. The toolkit is composed of eight sections that cover a range of potential topics that a local food policy council or advocate may wish to explore. Section one, General Legal Setting, lays out some of the basic information relevant to the local government’s authority to makes laws. This section gives an overview of the types of food law and policy regulations that can be implemented at the local level, as well as some local government agencies with which councils should partner. Section two, Food System Infrastructure, describes the important roles of all the entities and processes that make up a local food system. This section details policies that encourage and support local food-related business at every step of the supply chain, including production, processing, distribution, retail sales, marketing, and waste management. The third section, Land Use Planning and Regulation, gives a broad overview of zoning and land use concepts to offer local food policy councils an understanding of the state and local laws surrounding land use. A familiarity with the laws that govern land use can be beneficial for advocates who want to improve the existing legal scheme to further their goals. Section four, Urban Agriculture, describes a variety of ways local food policy councils can work with local governmental or non-governmental partners to support existing or potential urban agriculture initiatives. This section includes information concerning zoning and resource allocation for urban agriculture, as well as addressing environmental concerns such as converting former brownfields to land that is suitable for urban agriculture. The fifth section, Consumer Access & Consumer Demand, presents an introduction to the policy changes that can help connect communities with more outlets to purchase healthy foods. This section describes a variety of different solutions to increase food access, including farmers markets, community-supported agriculture (CSAs), mobile vending, retail establishments, healthy corner stores, and community gardens. A new section in this updated toolkit is section six, Procurement. The section describes potential measures food policy councils can pursue to adopt procurement policies that favor local and regional producers, as well as fair labor practices, environmentally-sustainable production methods, and humane treatment of animals. Section seven, School Food and Nutrition Education, has been heavily updated. It details the ways in which local food policy councils can work with local agencies and school districts to improve the quality of the food served in school meals, and create or enhance nutrition education programs. This section also explores programs such as farm to school initiatives and school and community gardens that connect students to the topics of food and agriculture. The final section, which is another addition to the updated toolkit, is section eight, Decreasing and Recovering Wasted Food. It describes how food is wasted all along the supply chain and provides steps that advocated can take to minimize wasted food at all levels of the food chain. 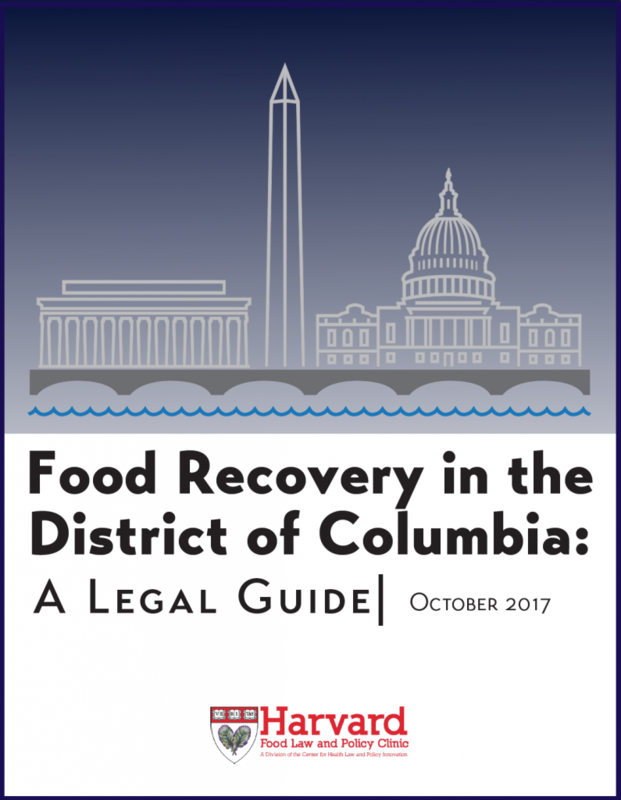 The toolkit is a valuable guide for advocates who seek to influence food law and policy in their local communities. It is part of a growing collection of resources created by the Food Law and Policy Clinic at Harvard Law School to assist and support local policy advocates. The toolkit will also be followed by a public webinar on October 26 at 1 p.m. E.T. during which the Food Law and Policy Clinic will provide an overview of the toolkit and will answer questions from participants. To participate in the webinar, please register. Read Good Laws, Good Food: Putting Local Food Policy to Work for Our Communities. The Center for Health Law and Policy Innovation of Harvard Law School (CHLPI) and the National Viral Hepatitis Roundtable (NVHR) today released Hepatitis C: State of Medicaid Access—a report and interactive project grading all 50 state Medicaid programs, as well as the District of Columbia and Puerto Rico, according to access to curative treatments for hepatitis C, the nation’s deadliest infectious disease. More than half of Medicaid programs (52 percent) received a “D” or an “F” for imposing discriminatory restrictions on hepatitis C cures. Hepatitis C: State of Medicaid Access—which is available online in interactive form and unveiled today at the American Association for the Study of Liver Diseases (AASLD) Liver Meeting in Washington, D.C.—grades each state, as well as the District of Columbia and Puerto Rico, according to its overall “state of access.” Each grade is determined by curative treatment restrictions related to three areas: 1) liver disease progression (fibrosis) restrictions, 2) sobriety/substance use requirements, and 3) prescriber limitations—all of which contradict guidance from the Centers for Medicare & Medicaid Services (CMS), as well as recommendations from AASLD and the Infectious Disease Society of America. The report also offers suggestions for each state to reduce its treatment access requirements. On its interactive site, Hepatitis C: State of Medicaid Access also includes ways to get involved. Users are invited to share their stories, sign a petition calling for better treatment access, and advocate for the issue on social media. This past weekend California Governor Jerry Brown signed AB 954, a bill encouraging food manufacturers, processors, and retailers responsible for the labeling of food products to use standard phrases to communicate quality and safety dates. The Harvard Law School Food Law and Policy Clinic (FLPC) has been working closely with advocates since the inception of the bill and we are excited to see California taking yet another serious step to curb food waste! Earlier last week, Governor Brown signed AB 1219, the California Good Samaritan Food Donation Act, into law; it expands and clarifies liability protections for food donations in California to help reduce waste and food insecurity at the same time. Both bills aim to reduce the 5.5 million tons of food sent to the landfill each year in California. Research has proven that that labels are a major contributor to food waste. Since there are no federal standards for date labeling (with the exception of infant formula), states have enacted a broad range of date label laws, and manufacturers use a dizzying variety of date labeling language on food products. 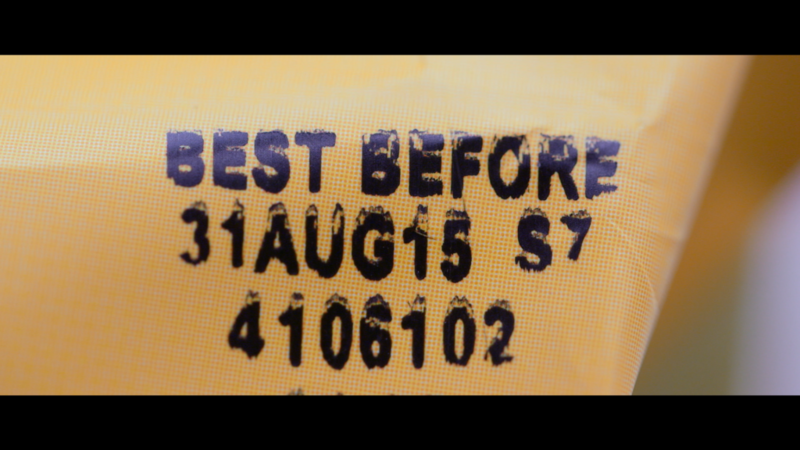 Date labels are generally not intended to communicate safety information, but consumers frequently misinterpret these quality estimates as indicators of safety, and many throw food away past the date due to fear of safety risks. Standardizing date labels can thus play an important role in reducing consumer confusion, and has been found to be the single most cost-effective solution to reducing food waste in the U.S.
AB 954 promotes the use of the terms “BEST if Used by” or “BEST if Used or Frozen by” to indicate a quality date, and the use of the terms “USE by” or “USE or Freeze by” to indicate a safety date. These phrases mirror the voluntary dual date label system (“BEST If Used By” for quality dates and “USE By” for safety dates) proposed by the Food Marketing Institute and Grocery Manufacturers Association earlier this year. The law also encourages manufacturers to develop alternatives to consumer-facing “sell-by” dates, which can increase confusion among consumers. This bill represents an important step forward, and this progress will improve the environment and increase food security, while saving money for consumers, businesses, and government. Written by Natalia Szeremeta, Food Law and Policy Clinic intern and Boston University student. 38 million – that’s how many additional people are suffering from hunger since 2016. 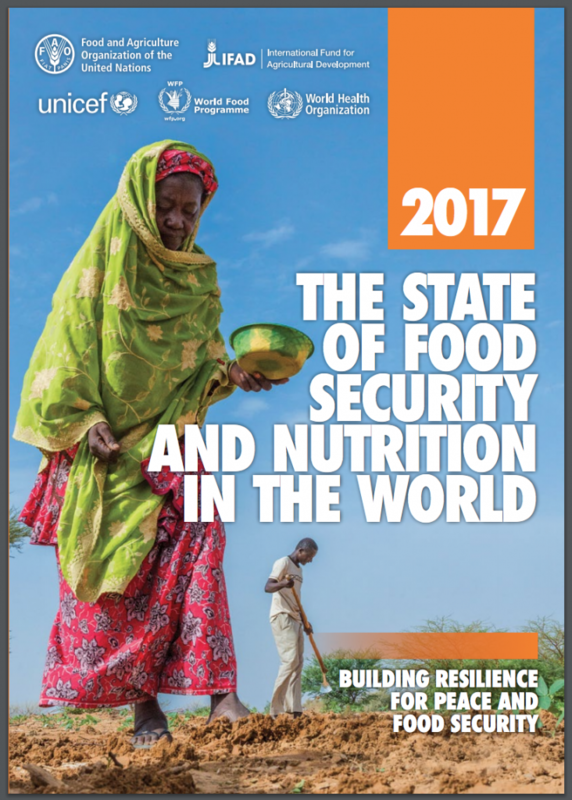 Recently, the United Nations (UN) released a report entitled The State of Food Security and Nutrition in the World, which highlights how hunger, obesity and other nutrition-related issues have been increasing since 2016, and the factors that have contributed to these trends. This report follows on the heels of the adoption of the 2030 Agenda for Sustainable Development, which promises an effort “to end poverty and hunger, in all their forms and dimensions, and to ensure that all human beings can fulfill their potential in dignity and equality and in a healthy environment.” The report is the first step toward reaching this goal by providing an assessment of the current global situation and the main issues that need to be addressed. Yet, the breakthrough that this new partnership signifies, might not be enough to guarantee success, given the numerous and complex factors contributing to diet-related issues – e.g. climate change, economic slowdown, weather events, to reach the goal of ending hunger and malnutrition by 2030. As Paula Quatromini, an Associate Professor and Chair at the Department of Health Sciences at Boston University, expounds “These are huge problems of global proportions that demand policies, environmental interventions, and industry-level changes in order to address the life circumstances and environments that millions of people worldwide live in (…)”. The magnitude of the problems that would need to be addressed is staggering. While 815 million people worldwide are affected by undernourishment, many more are facing other diet-related issues, such as obesity among adults and children under the age of five and anemia in women of reproductive age. The report acknowledges that reaching the zero-hunger threshold and ending malnutrition might not be feasible, especially in countries affected by conflict. These countries pose a uniquely difficult challenge due to the rampant food insecurity. Nevertheless, the idea that hunger can be eradicated in other non-affected areas is also unrealistic, given the data compiled by the United Nations report. The State of Food Security and Nutrition in the World is a promising first step in the direction of documenting the most significant diet-related issues around the world and their root causes. However, the 2030 Agenda goals remain highly optimistic, and should be amended to focus on smaller and more feasible changes in very complicated and diverse food systems around the world. This could be done by adopting measures directed towards reducing food waste, supporting local agriculture, or providing food relief to countries affected by conflict. Yesterday, California Governor Jerry Brown signed the California Good Samaritan Food Donation Act (AB 1219), introduced by Assembly Member Susan Eggman (D-Stockton), which expands the state’s liability protections for food donations. The Harvard Law School Food Law and Policy Clinic (FLPC) has been working closely with advocates in California since the inception of the bill, and we are excited to see it go into effect. Specifically, AB 1219 expands liability protections to cover donations of food given directly from food donors to end recipients, as long as the donor makes a good faith evaluation that the food is safe to eat. It also explicitly provides protections for past-date foods that are fit for human consumption. Finally, it requires health inspectors to promote food recovery and educate local businesses and organizations about existing liability protections for food donations. See our earlier blog post for more information. These provisions will go a long way toward reducing confusion and promoting food donations in California. Food insecurity affects 1 in 8 Californians and 1 in 4 children, while food waste is the largest component of waste sent to landfills in the state. AB 1219 addresses these issues jointly by improving liability protections for food donors across the state. As Assembly Member Stockton commented, “Reducing food insecurity is an achievable goal. My bill will cut down the amount of food ending up in landfills by encouraging donors to help hungry Californians.” We applaud California for this exciting achievement!